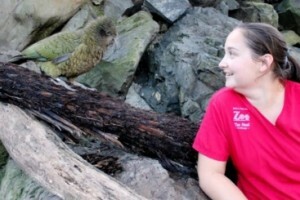 In this podcast episode we talk to Sarah Van Herpt from Wellington Zoo. This is part one of what will be a two-part episode where we cover a large range of information regarding Sarah’s experience in implementing and managing enrichment programs as a zoo keeper, wildlife nurse and pet owner. 3:50 Sarah shares a definition of enrichment. 12:00 We talk about the importance of using enrichment with your pets at home. 13:30 Here Sarah discusses how we can potentially use enrichment to redirect some of the behaviors we label as undesirable with our pets. 17:28 We talk about the importance of enrichment in a zoological setting. 19:35 We talk about the importance of enrichment in vet clinics and wildlife hospitals. 23:20 Sarah shares stories about her recent trip to China where she attended the 15th International environmental enrichment conference. Sarah Van Herpt (Wellington Zoo). Sarah is a life-long learner, and has a few different degrees under her belt! Sarah studied as an undergraduate at Massey University, New Zealand (BSc, Ecology and Zoology) as well as completing a Masters degree (MSc, Conservation Biology) from the same university. During her studies it really hit home that her passion was animal behaviour. Sarah Master’s looked at how we can combine behaviour with conservation outcomes, looking at the native New Zealand kokako song and how it changes in the presence of multiple dialects, or languages. 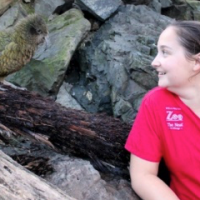 After Sarah completed her studies she was lucky enough to get a job at Wellington Zoo, where she has been for the past 7 years. Although Sarah considers herself a “bird-nerd” at heart, she has looked after many different species including primates, birds, reptiles, invertebrates, small carnivores and hoof-stock. 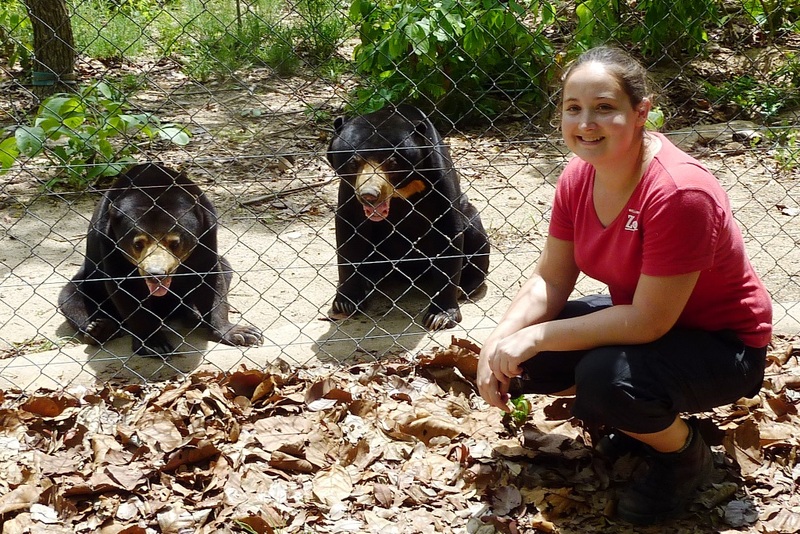 Sarah also did a 2.5-year stint as a vet nurse after training and obtaining a certificate in Veterinary Nursing whilst working as a zoo keeper at Wellington Zoo. Throughout Sarah’s time as a keeper she has become really interested in enrichment. Sarah has run enrichment projects and committees throughout Wellington Zoo, and in 2014 teamed up with the Australasian society of zoo keeping to bring the shape of enrichment workshops to New Zealand. These workshops had Valerie Hare, one of the co-founders of Shape come and personally deliver the workshops at Wellington Zoo. In 2015 Sarah was awarded a Shape of Enrichment grant to talk at the 15th International Conference on Environmental Enrichment in Beijing, China. CLICK HERE to see the five enrichment categories Sarah discusses from the shape or enrichment website. I wonder if you could arrange a podcast with the associated Pet Behaviourist, Karen Wild. It could be quite the intriguing conversation! I enjoyed your podcast very much. It is a great learning tool for professional animal staff and private owners. It is full of good information and inspiration.